(WATCH VIDEO) Are you worried that your lawyer will secretly record you? And that the recording won't have enough pizzazz? 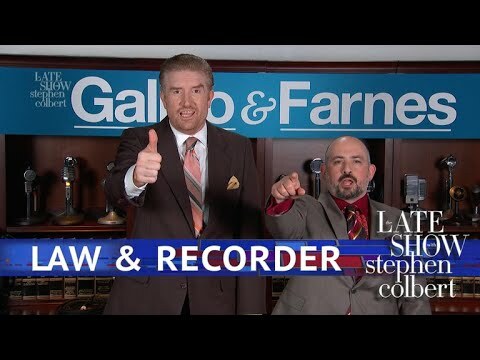 The only two people who know more about lawsuits than Donald Trump are his two new attorneys, Galinos and Farnes. ARE YOU WORRIED THAT YOUR LAWYER WILL SECRETLY RECORD YOU? AND THAT RECORDING WONT SOUND GOOD? THEN CALL US, GALINO AND FARNES! WE'RE ONLY THE BEST AT SECRET RECORDING EQUIPMENT. PAYING A PLAYMATE WHILE RIDING A HORSE. OR IN A THUNDER STORM. OR SAILING ON A SHIP. ADMITTING CHEATING ON YOUR WIFE THAT YOU CAN BE PROUD OF. ITS THE LATE SHOW WITH STEVEN COLBERT.